Our business has just had our 36th anniversary! There are three reasons that our family has been so successful in this industry. The first reason is that we are committed Christians. We are very active in our churches, and most of the people that work for us are also believers. All we do, we do for Christ who redeems each and every one of us. The second reason for our success is that we have very strong family ties. Even though we have been separated by geographical location, we use the wreath business as another reason to remain close all year long. We combine all of our talents, and contacts to continue to build the wreath business year after year. The third reason we remain successful is that we have maintained the highest standards when it comes to producing our wreaths, and helping our clients.Our Goal is to produce wreaths that stand alone in Quality. We take no short cuts.We use alpine fir tree boughs to make our wreaths, because we believe that they are the most aromatic of the pines, and the color of the boughs are so beautiful ranging from a silvery blue to a deep green. Our trees don’t grow on farms. 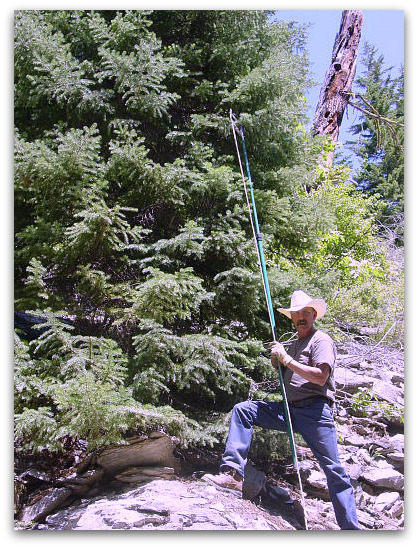 The alpine fir trees only grow in the Rocky Mountain areas above 5,000 feet. We wait until after the first hard frost before we begin collecting the boughs to make the wreaths. The frost causes the needles of the alpine to set, creating a longer lasting wreath than you will not find anywhere else. We are environmentally conscientious when we collect our boughs, only pruning the outer ten or so inches off of the trees. This stimulates the growth, and in a year or two, the trees are healthier, and fuller than they would be if we had not trimmed them. You will not see a factory wreath here! The boughs are brought back to our little farmyard in the beautiful Missoula valley, where one of our wreath makers pick through the boughs, using only the most beautiful pieces to hand-craft the wreaths. They are well cared for; watered daily, and with the cool weather, it is as though our backyard is a floral cooler. Once our orders are filled, we decorate the wreaths with ponderosa pine cones (that are collected in the valley), and tie a red velvet bow and little red berries on the wreaths. We ship and deliver the products fresh from the Montana. We also receive great Joy in the relationships that we build with our clients. They become a part of the Holiday Wreath Family. We pray that you will have the same successes in your fund-raising experience, and become a part of our Holiday Wreath Family.